Wow... just WOW! Do your kids come home with loads and loads of paperwork, graded tests, art projects, information forms and other papers that just start to overtake your counters, drawers and all the free space? I for one have a problem throwing everything out... I guess you could say I'm a memory hoarder. I want to save everything that my kids bring home so they can look back at their old work and reminisce over all their great memories. I believe I got this "feeling" from my mom who saved all of my stuff from school. I really do appreciate that she saved all of it. I've been able to show my kids my old schoolwork and art projects and they think its really cool. When we bought our first house my husband took notice of all the boxes of old stuff I had and thought it was way to much. My boxes did take up quite a bit more space than his one... yes ONE box! I think my boxes filled at least half of the garage. 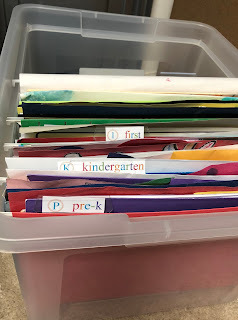 Well it didn't start to really bother me until we had more than one child bringing in loads of paperwork and the stacks just grew everyday and I got mentally exhausted trying to decide what to keep and what to throw away. I knew I was not going to be able to save it all and really was it all worth saving?? I decided I would try to save the most important items that held the most meaning and let the rest go. I decided that since we have three boys that they were going to end up with exactly what their dad had.. one box! 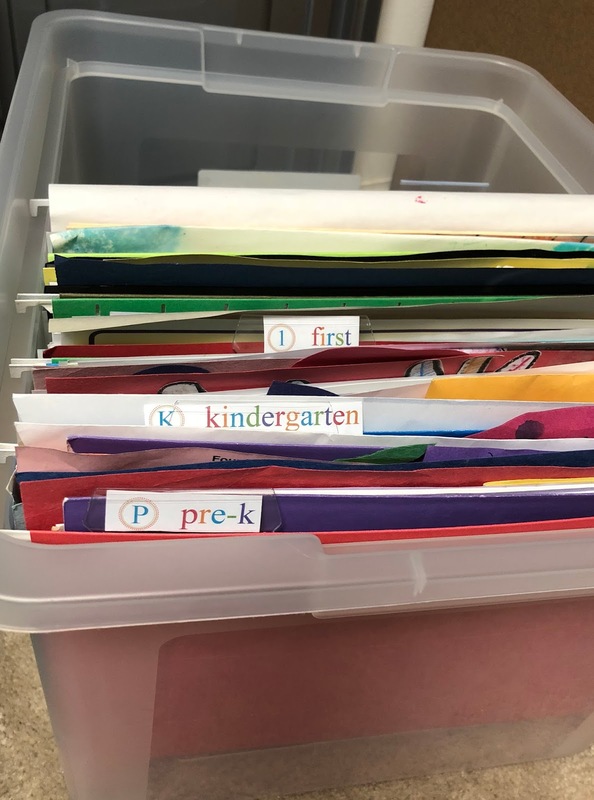 Each boy has one dedicated bin for all their saved work. I mean I don't wan to overwhelm their future spouses and plus to guys really care as much as we do? Well when I first started my 3 bin organization it really did not look that great and really wasn't a "system". So I scoured the internet for some help. I found this really great article that shows exactly how this organization system should look and work at iHeart Organizing.... she even has included all the printable to make it super easy. Come on parents, lets find our free spaces again and declutter those less meaningful items that are taking over our homes. Do you have an organizaing system that works for your family? Please share, I'm always looking for ways to improve!